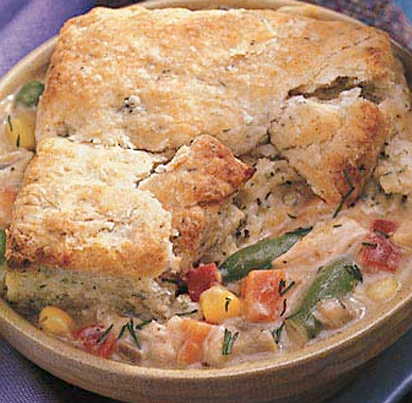 An epic chicken and garlic pie with cheddar biscuit topping. What are you waiting for? Boil potatoes, carrots and celery for 10 minutes. Melt butter with the garlic and shallots. Whisk in the flour a little at a time. Add the chicken broth to the roux and whisk vigorously. Add cream and 250ml of milk and continue whisking. Add the bay leaf, herbs and season. Add potatoes, carrots, celery and chicken. Cook for 15-20 minutes (stirring frequently) until the chicken is cooked and sauce thickened. Pour pie filling into a deep casserole dish. To make the biscuit topping: Combine Bisquick, garlic and cheese in a bowl. Stir in 230ml milk until combined. Roll out to same size as casserole, lay over filling. Bake for 30-40 minutes until the filling starts to bubble and the biscuit topping is golden brown.